Thursday, November 2 at the Whitney Humanities Center Auditorium, 53 Wall St.
Friday and Saturday, November 3 and 4 at the Luce Hall Auditorium, 34 Hillhouse Ave. Many historic sites, museums, media, and other public history venues are reluctant to broach the subject of slavery in their programming and exhibits. Nonetheless, using innovative methods that are both thorough and respectful, curators and educators at historic sites and museums often have resources to teach this controversial topic in ways that those in the traditional classrooms do not. Reading the African presence back into the landscape of historic houses and other sites and can give new meaning to old artifacts, documents and environments, enabling public historians to engage old and new audiences in meaningful ways. 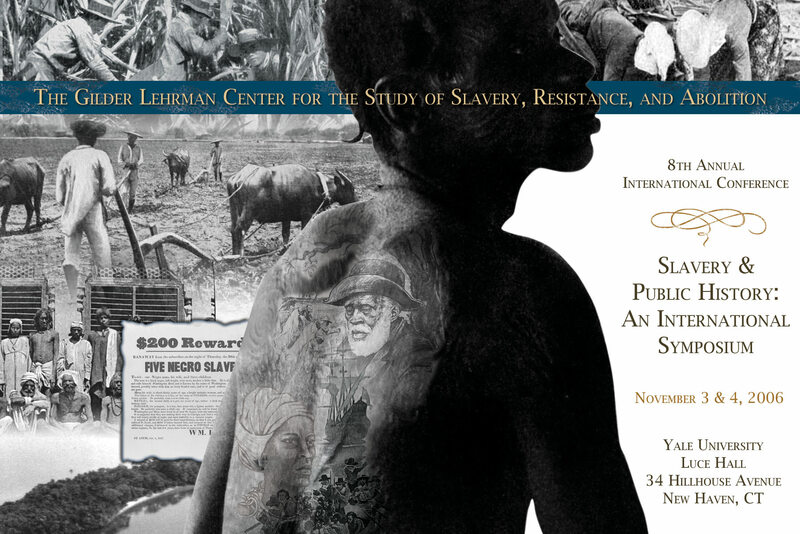 At our 8th Annual International Conference we examined how historic sites, museums, and other public history venues have dealt with the topic of slavery and how public historians have used resources to teach this often difficult topic. Furthermore, worked to uncover what issues public historians across the world have faced when addressing slavery and how their work has been received by others. We also hope to address broader questions about if and why dealing with slavery through public history is important and why slavery is often such a difficult topic for public historians to represent. For a fee of $5, credit for 1.475 Continuing Education Units (CEUs) will be awarded to public high school teachers who attend the conference.� Please inquire about receiving CEU credits at the conference registration table. For a fee of $5, credit for up to 1.6 Continuing Education Units (CEUs) will be awarded to public high school teachers who attend the conference. Please inquire about receiving CEU credits at the conference registration table.